NuVant Systems has released ELAT™ LT-1400 Gas Diffusion Layer (GDL) back on to the market at a fraction of the cost while naming FuelCellsEtc as their sole distributor. The new price of ELAT is expected to make the product far more suitable in cost sensitive applications than it has ever been in the past. FuelCellsEtc will also be providing value added services of manufacturing catalyzed Electrodes (gas diffusion electrodes) and Membrane Electrode Assemblies (MEA) using ELAT. 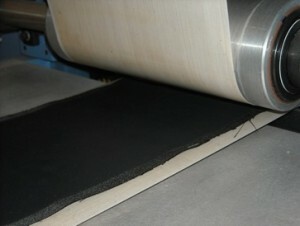 ELAT is a woven carbon cloth GDL with a carbon microporous layer. It has been engineered to have state-of-the-art performance over a wide range of operating conditions and plays a critical role in the efficiency of fuel cells. ELAT’s suggested uses include fuel cells, electrolysis, flow through batteries, water clean-up electrochemistry and more. A fuel cell is a device that generates electricity by a chemical reaction from two electrodes (an anode and cathode) and an electrolyte; it uses a chemical reaction to produce electricity much like a battery, but unlike a battery, a fuel cell never runs out of “juice” and never needs to be recharged so long as it has a constant supply of hydrogen and oxygen. The Gas Diffusion Layer (GDL) is located between the gas flow channels and the catalyst/ PEM layer. The GDL’s purpose is two-fold: 1) it allows gas to diffuse from Gas Flow Channel to the Catalyst and 2) allows water to flow away from the catalyst. This is a very critical role: too little water will result in high membrane resistivity and too much water “floods” the fuel cell, preventing efficient gas flow to the catalyst. EDIT (December 13th, 2017): As of this time FuelCellsEtc has acquired the brand and manufacturing rights of ELAT from NuVant. Check it out our store or view or download the property sheet here. Those interested in learning more about ELAT can contact FuelCellsEtc at askus@fuelcellsetc.com or 979-635-4706, or by visiting www.fuelcellsetc.com/store. FuelCellsEtc specializes in manufacturing high performance custom fuel cell and electrolyzer components to product manufacturers, researchers and educators around the world. The company prides itself on industry leading customer service and lead times. FuelCellsEtc’s primary products include Membrane Electrode Assemblies (MEAs), Catalyst Coated Membranes (CCMs), and Gas Diffusion Electrodes (GDEs), all for a wide variety of fuel cells and electrolyzers. NuVant Systems Inc., founded in 1999, develops and licenses advanced fuel-cell components and component evaluation instrumentation. The company licenses its technology to fuel-cell developers and manufacturers, and performs contract research in the areas of catalyst discovery and fuel-cell system prototyping.